There's not really any setting more conducive to a super-chic gala event than an iconic museum, is there? Especially when French fashion house Dior is throwing the party and the guest list is also a tabloid best-dressed list. 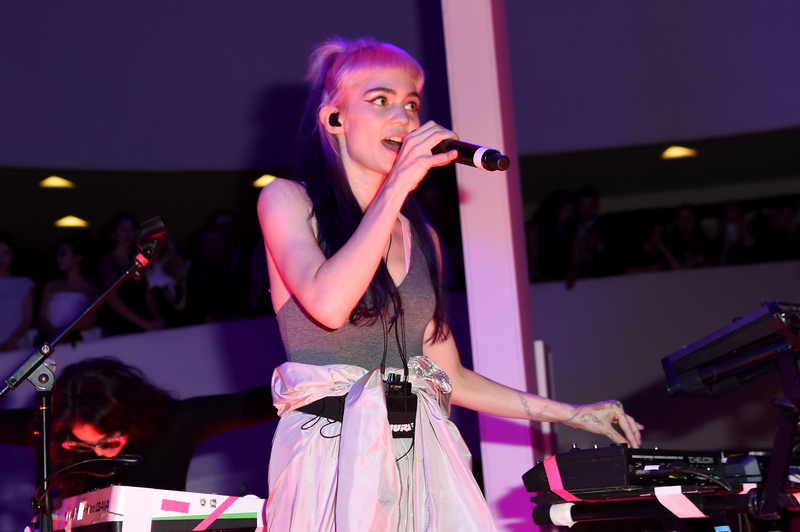 Dior hosted the Guggenheim International Gala pre-party on Wednesday, where Grimes put on a killer, high-energy performance. Raf Simons, who is just on his way out as creative director for the luxury brand, was there, as was former Lucky editor-in-chief Eva Chen, who looked fresh to death in a leather top and a side-slit skirt. Keirnan Shipka all but solidified her style icon status in a rather elaborate Dior dress that featured an upper-abdomen cut-out (my favorite!) and beautiful beading in bright orange. Let's go back to the fact that Grimes performed, shall we? She did a 30-minute set of clubby, electronica-forward songs, all while wearing sparkly Dior sneakers. The slightly androgynous Grimes, who is definitely not afraid to experiment with kooky style, is a really interesting choice for the house of Dior, which until very recently has been all about an elegant, super-feminine aesthetic. It seems the label is trying to tap into its younger, more playful side, and selecting Grimes to perform seems to be a testament to that. Here's all the stand-out style from the impossibly chic party. I love how Shipka always seems to channel her Mad Men character's sixties style, and this dress is no exception. The colors are the perfect combination, and I love that she wisely wore her hair up, to let the beadwork speak for itself. It's always fun to coordinate matching outfits with your bestie, isn't it? Both ladies looked amazing in crop tops over pleated bottoms — palazzo pants for TK Wonder, and a maxi skirt for Quann. I knew Chen is edgy, but this is a whole new level for the style star. I love the skirt and top combo, but the tights seemed a little too casual for the evening's affair. This is actually a pretty cool look — the deep V-neck of the dress (filled in with white lace) adds a very Victorian touch, but the sleeveless-ness keeps it young. A$AP definitely has an aesthetic, and he rarely strays from it. Hey, it definitely works, and he looks great! I love her ombre pink-to-purple ponytail, and while her outfit is not exactly what I think about when I think of Dior, there's something kind of cool about it, in a very nineties-kid way.